The specialty of Thunder's Pack Canine Training in Brookfield, IL is taking dogs of all breeds, all ages, all temperaments, and making them loving, obedient members of your family. Thunder works with the dog and its family members in an in-home environment. The home environment is often where the behaviors emerge, thus making it the best place for the training to occur. The dog's behavior is adjusted by its human family members, with Thunder's guidance, so that the family has the skill set and tools to maintain not only the behavior but the balance of their "pack." If you are in need of training assistance with your difficult dog, Thunder Ruthven comes highly recommended. Thunder has a loving, gentle and professional way to accommodate various situations and instructs all breeds. His techniques will help you and your dog develop better communication, establish a strong bond and acquire the results needed. 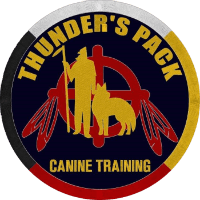 ​​Thunder’s Pack Canine Training and Services provides the foundation for a happy, healthy, loving, and obedient relationship that you, your family & your dog can enjoy together. Thunder has a keen understanding and love of dogs matched by his ability to guide owners to become effective "pack leaders." Our relationship with Cosmo has been so enhanced by Thunder's training. Cosmo has become such a joy as a result. He's just great! Thanks for the great training. Cosmo thanks you too. I volunteer with a rescue group and currently have 2 energetic foster dogs as well as a very playful 2 yr. old puppy. I needed help with my three very rowdy boys, but I did not know who to call. After speaking with several trainers and behaviorists, I decided to work with Thunder. I liked that he came to our home where the dogs were most comfortable and they behaved most naturally. Each dog had his own unique set of problems and needs, so the situation was complicated. From the first visit, Thunder knew what to do to get control of the dogs' behavior. After 3 months of hard work,they are now more calm and obedient,the house is more peaceful, and our daily routine is easier. I have enjoyed learning from Thunder. His help has been essential in restoring peace to our home. Thunder has always been most generous with his time and advise. His training style is firm and kind, and his love and caring for the welfare of the dogs always shines through.